And Yet They Deny: Eugenics In Action: "Packham: Stop Bleating And Have Fewer Kids"
Eugenics In Action: "Packham: Stop Bleating And Have Fewer Kids"
People should have fewer children instead of "bleating" about endangered animals, according to a TV wildlife expert. Controversial host Chris Packham has even called on the Government to offer financial rewards to those who have just one child - and more for those who stay childless. 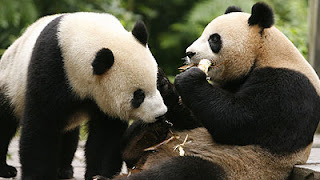 "There's no point bleating about the future of pandas, polar bears and tigers when we're not addressing the one single factor that's putting more pressure on the ecosystem than any other - namely the ever-increasing size of the world's population. "I read the other day that, by 2020, there are going to be 70 million people in Britain. Let's face it, that's too many. "I wouldn't actually penalise people for having too many children, as I think the carrot always works better than the stick. "But I would offer them tax breaks for having small families, say, 10% off your tax bill if you decide to stick with just one child. Packham said it was time to let pandas die out. "And an even bigger financial incentive if you choose not to have a family at all." In the interview with the Radio Times, Packham adds: "Fact is, we all eat food, breathe air and require space, and the more of us there are, the less of those commodities there are for other people and, of course, for the animals." Packham, who has a 16-year-old stepdaughter who lives with his ex-partner, said: "I consider it one of the great privileges of my life to play a part in her upbringing, and would happily throw myself in front of a train to protect her. "It doesn't bother me one bit that she doesn't share my genes." The BBC presenter added: "In fact, I do not now - and never have had - any desire whatsoever to reproduce myself." Packham previously sparked controversy when he questioned the millions spent trying to save the giant panda from extinction.